I’m back! I enjoyed my summer off from blogging, but I hope this marks the beginning of more regular posts from me. We’ll see…I have to get myself back in the habit of both blog reading and writing. With the beginning of the new school year, my family is getting used to a new schedule. School starts two hours earlier than we have been used to in previous years! I feel like I have done a good job establishing a new rhythm to my day, now I just need to insert blogging into that new routine. I am getting my blogging feet wet with a Tuesdays with Dorie recipe: Jam-Filled Sandwich Cookies. 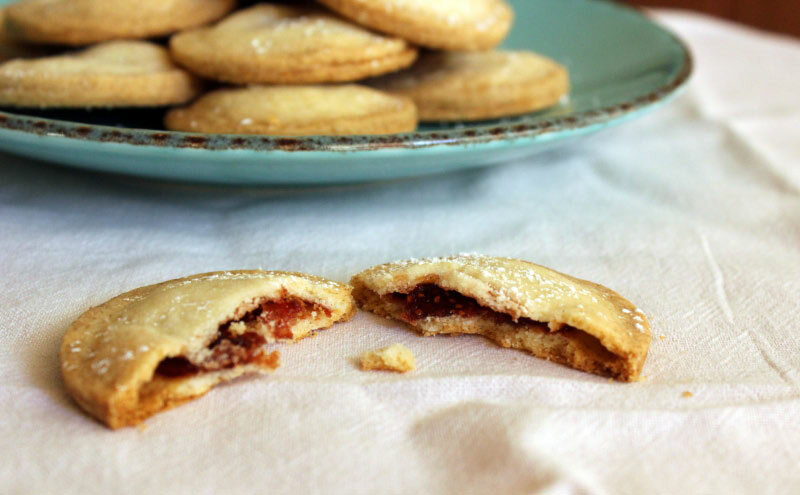 These are a simple shortbread-like cookie with your choice of jam filling. I used a homemade strawberry-vanilla jam. Yum! What a fun recipe! These were easier to make than I expected. You just need to leave plenty of time for chilling the dough. I used a biscuit cutter with a two-inch wide circumference and found that a generous 1/4 teaspoon of jam was just about right. More might have seeped out the sides, and less tasted too skimpy. If you are interested in trying these tasty cookies, you can find the recipe in Dorie Greenspan’s latest book, Baking Chez Moi. Happy French Friday! 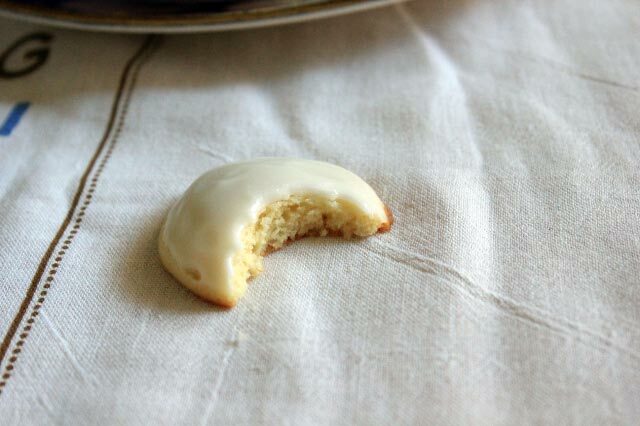 We’re taking a break from the fishiness this week with a super simple cookie called Croquants. 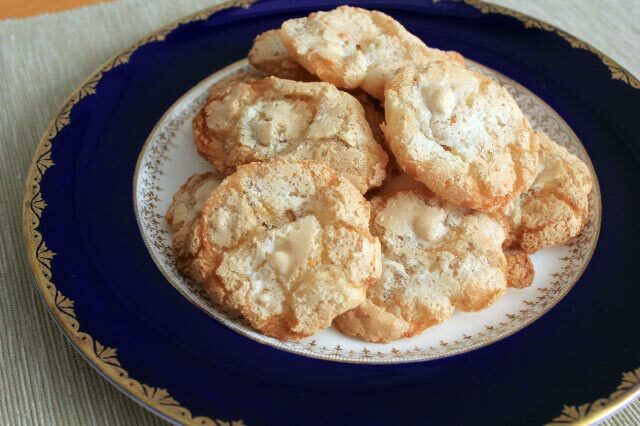 Croquants are a crisp and crunchy cookie made from nuts, sugar, egg whites, and a small amount of flour. Almonds and hazelnuts are the most commonly used nuts in Croquants, but I used Dorie’s “house favorite” salted cashews. These might really be the fastest, easiest cookies I have ever made. Mixing up the ingredients took about two minutes with a bowl and spatula. No need to haul out the mixer! I loved these little cookies. They are light as air and very crisp. The flavor reminds me of something, but I can’t put my finger on it. Using the cashews was a good call, but I imagine they would be very good with almonds too. This post participates in French Fridays with Dorie. Merry (day after) Christmas!! I hope all of you who celebrate had a wonderful day. We had a lovely time with plenty of good food! I have a lot of cooking and knitting and even a bit of sewing to catch you up on! I will tackle them one at a time over the next few weeks, so keep your eye out for new posts from me. For the last several years the French Fridays with Dorie group has done a Christmas Card Exchange. This is the first year I participated and it was so much fun! 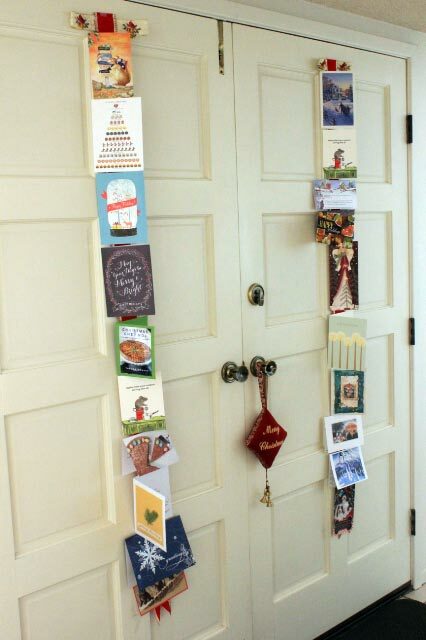 I loved getting the mail each day to see who I got cards from. Here is a photo with most of the cards I received (I am still waiting on a few…and I have a feeling a few of you are waiting on mine). I hung them all on our front doors. Today for French Fridays with Dorie the group is doing something a little different. As part of the card exchange, participants could also share a favorite cookie or drink recipe. Then, if we wished, we could each make one of those recipes and share it on our blogs today. I decided not to participate in the recipe exchange, so I am doing a make-up recipe instead: Speculoos. 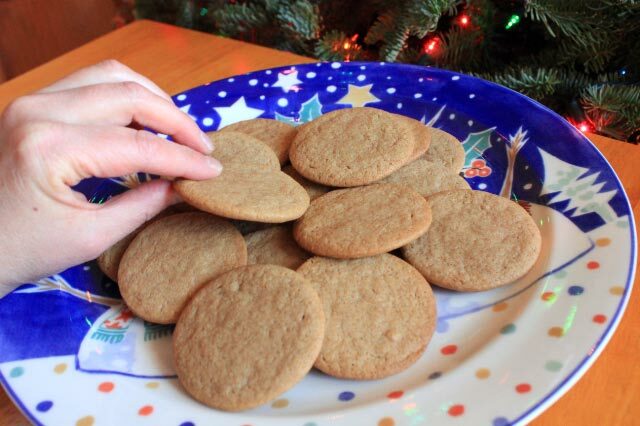 Speculoos are a spicy brown-sugar cookie recipe popular across Europe. They are especially popular around Christmas-time. 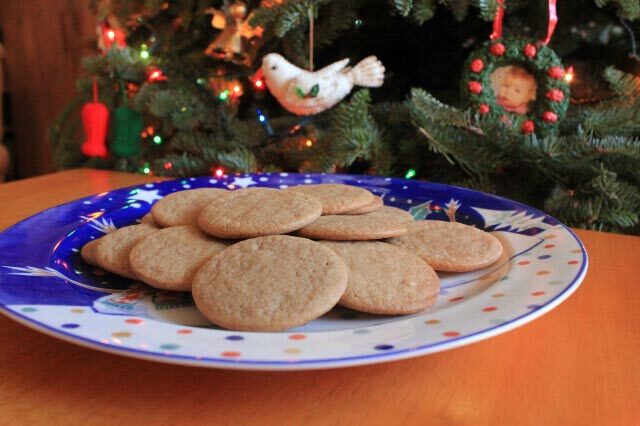 I had been meaning to make these cookies for the last couple Christmases, and finally made them this year. Dorie’s recipe includes a lot of cinnamon (yum!) and a touch off ginger and cloves. They are sturdy enough to be cut into shapes, but I made simple round cookies. Watch out! These cookies with disappear quickly! I loved these cookies! Cinnamon cookies are a favorite and these did not disappoint. Based on how quickly these cookies got eaten, I think everyone in the family liked them. If you would like to try Speculoos, Dorie’s recipe can be found here on her blog. Happy French Friday! I am doing a make-up recipe for French Fridays with Dorie today because I couldn’t find a key ingredient (kumquats) for this week’s recipe. I have been assured that kumquats will be in the market in a couple weeks, so I will make that recipe soon. 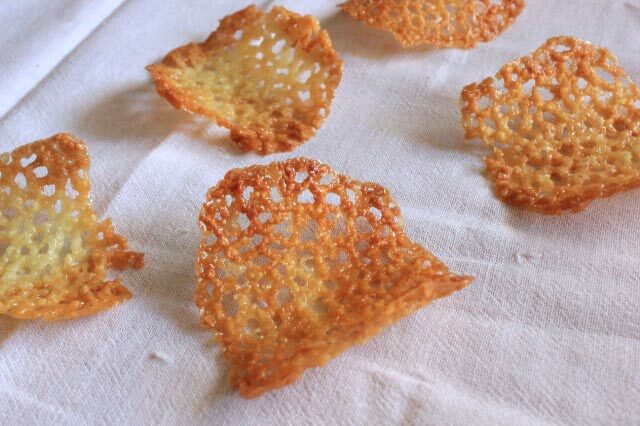 Instead I made Almond-Orange Tuiles. I am down to only two make-up recipes! Not including the one I didn’t make this week…so really three. 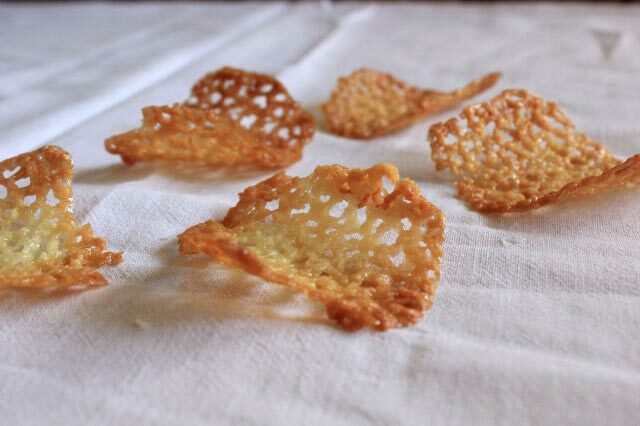 Almond-Orange Tuiles are a lacy, light, little cookie. They are very easy to mix together, taking only minutes. The tricky part happens after they are done baking. You are to transfer these lacy cookies onto a rolling pin so they can set in their curved shape. The first one I tried ended up in a little lump on the counter. It almost slid down between the stove and the counter, but I caught it just in time! I finally got the hang of making these pretty cookies and I thought they were delicious. The flavor from the orange juice is subtle but nice. I ate these on their own, but I think they would be at their best adorning something like ice cream or a creamy cake. They would also be a nice addition to a dessert buffet. Welcome to my very first Tuesdays with Dorie post! 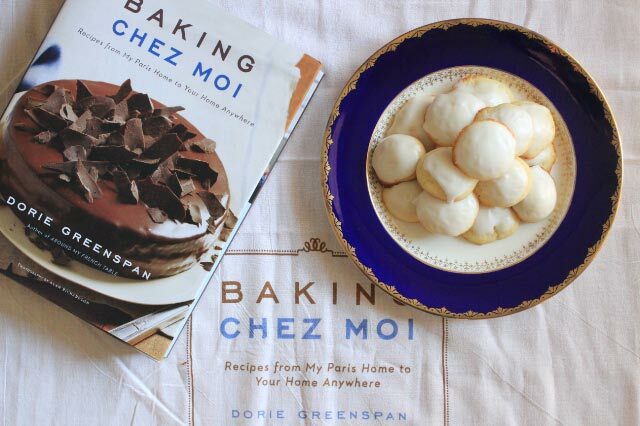 We will be baking our way through Dorie Greenspan’s brand new book, Baking Chez Moi: Recipes from My Paris Home to Your Home Anywhere. A little history lesson: Over six years ago, Tuesdays with Dorie was begun by a few bloggers wanting to bake their way through Dorie’s book, Baking: From My Home to Yours. When Around My French Table came out four years ago, French Fridays with Dorie was spun off, and I joined that group a few months after it was created. Now that Dorie’s new book is out, Tuesdays with Dorie is taking it on! I have decided not to try making every recipe from this new book like I am with Around my French Table. I will just do those recipes that sound good to me and that I have time for. I just can’t make that many desserts! Luckily for me, the first recipe the group chose was one that sounded really good to me. 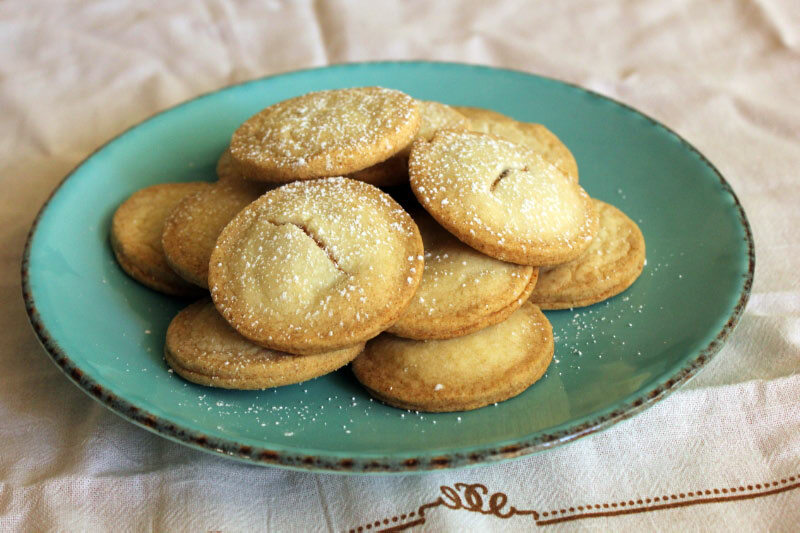 The inaugural recipe from Baking Chez Moi is a delicious cookie called Palets de Dames, Lille Style. 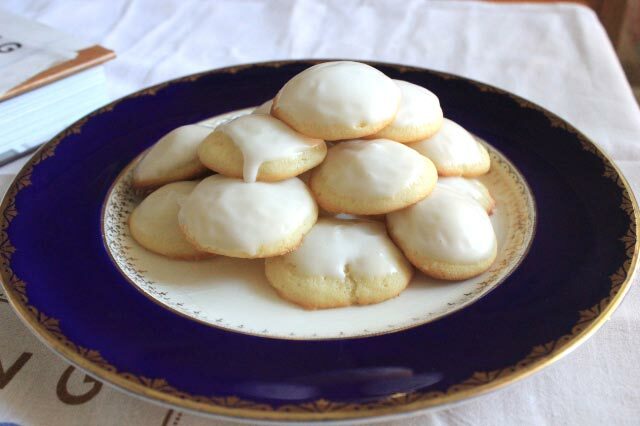 They are a simple, slightly cakey, iced vanilla cookie. These cookies are as good as they look! I ate more of these than I care to admit. Their cute size means they are easy to pop into your mouth! My inability to stop eating these just proves that I can’t be trusted to bake every treat in this book and not gain ten pounds. This was a fun recipe to kick off Baking Chez Moi and my participation in Tuesdays with Dorie. Like FFWD, Tuesdays with Dorie does not share recipes. We want to encourage people to buy the book. However, this cookie recipe is available online here, if you are interested in giving it a try. Welcome to the November edition of my Bouchon Bakery Challenge! This month I made Oatmeal Raisin Cookies. I was looking for something quick and easy to make, partly because I didn’t have a lot of time this month, and partly because I wanted to try one of the more pedestrian recipes. 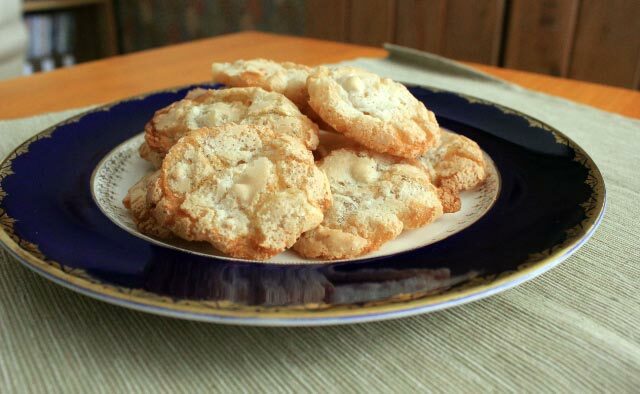 The authors describe these cookies as “crunchy on the outside and chewy on the inside”. That’s exactly how mine turned out. The texture was very pleasing and the flavor delicious. These are truly excellent cookies! While technique for making these cookies is very similar to normal cookie-making methods, I thought the end result was better than average. I took most of these cookies to Center for Adaptive Riding as a thank-you to the volunteers (my daughter takes lessons there), and the Director asked me for the recipe! I made 32 smaller cookies, rather than the 6 extra-large cookies the recipe would have you make. I baked them for 11 minutes using the convection feature of my oven. I did not bring the dough to room temperature before baking the cookies and I don’t believe it harmed them in any way. It is probably more important if you make the larger cookies. The amount of egg called for is 62 grams, which is very close to the average weight of one large egg. I just used one whole egg without weighing it. In this case, why didn’t they just say “use 1 large egg”? The cookbook discusses the need to sometimes warm the mixing bowl to bring the butter to the correct consistency. They warm it by holding the bowl over a burner or using a blowtorch(!) on the outside of the bowl. What I do works very well: I soak a washcloth under hot water and hold it against the outside of the mixing bowl while I mix. StyleBlueprint shares the recipe as it is written in the book here. I like this version: Eva Bakes simplified the recipe for those of you who don’t have kitchen scales, or just want to measure out your ingredients for this otherwise simple recipes. None. I don’t generally have to make adjustments for cookies. I want to end this year-long project in style, by making Palet d’Or (page 117), a rich chocolate cake with chocolate cream filling. It will be our Christmas dessert, so look for the results some time between Christmas and New Year’s Eve. Why do we procrastinate? I have always been good at procrastinating. I was the one starting my papers in college at the last minute and getting them done just in the nick of time. And I have trouble completing house projects because I don’t have deadlines (I have tried setting my own deadlines, but I’m not fooled). I even procrastinate fun things, like making these cookies. Why? I knew all month I wanted to make these cookies in time to write about them today, but I still made them at the last minute. Oh well, let’s talk about these cookies. They are called TKOs (Thomas Keller Oreos) and are Bouchon Bakery’s take on the classic American cookie. Now this is what Oreos should taste like! Not too sweet, but very chocolatey. The filling is very clever: it is a white chocolate ganache that is cooled and then whipped to become thick and spreadable. I did things a little differently. Instead of 8 large sandwich cookies I made 21 smaller cookies. Also, rather than piping the filling in concentric rings of teardrops, I used a 1/2″ tip and piped a plain dollop onto each cookie. I should have rolled out the cookie dough a little thinner, but I got a bit impatient with it. I froze the dough scraps to turn into chocolate cookie crumbs at a later date. If you are interested in trying TKOs, you can find the recipe here. While mixing the dough, I could not get it to come together. It was just a bunch of crumbs. I added ice water a tablespoon at a time until it began to come together, 8 tablespoon total. Even then, it was very crumbly and I had to really press it together. I’m not sure if this a problem with the recipe or just a result of my very dry climate, but it’s something to be aware of. The recipe doesn’t mention it, but these cookies really should be chilled before serving. Otherwise the filling is too soft and presses out when you try to eat it. None. I don’t generally have to made adjustments for cookies. In October, I am going to make Cream Puffs (page 160)! I will share my results with you on or about October 29th. Knowing me, I will probably be making them on October 28th. The French Fridays with Dorie gang had a Secret Valentine Cookie Exchange (thanks Alice for setting this up!). We were each assigned a Valentine and we made cookies for them! Each pair of cookies was wrapped in parchment paper, then placed in a plastic bag, and then finally wrapped in bubble wrap. The cookies traveled extremely well, without a single crumb out of place. Aren’t these cookies gorgeous? They taste as good as they look! The card is beautiful too (did you make it?). Thank you so much Gaye! I was the Secret Valentine for Adriana at Great Food 360°. Check out her site to see what I sent her. Cream together the butter, sugar, and vanilla. Beat until just becoming creamy in texture (Tip: Don’t over mix or the cookies will spread during baking). Beat in the egg until well combined, making sure to scrape down the sides of the bowl. Add the sifted flour and mix on low until a non-sticky dough forms. Knead the dough into a ball and divide it into 2 or 3 pieces. Roll out each portion between sheets of parchment paper to a thickness of about 5 mm (or .2 inch). Refrigerate for a minimum of 30 minutes. (Tip: Recipes commonly just wrap the whole ball of dough in plastic wrap and then refrigerate it for an hour or overnight, but by rolling the dough between parchment, this shortens the chilling time and then it’s also been rolled out while still soft making it easier and quicker). Once chilled, peel off the parchment and place dough on a lightly floured surface. Cut out shapes with cookie cutters or a sharp knife. Arrange the shapes on parchment-lined baking sheets and refrigerate for another 30 minutes to an hour. It’s very important to chill them again, otherwise they will spread while baking. Re-roll the scraps and repeat the process until the dough is used up. Preheat oven to 350°F (180°C). Bake cookies until golden around the edges, about 8 – 15 minutes, depending on the size of the cookies. Cool cookies completely on cooling racks. Once cooled, decorate as desired. Beat egg whites with lemon juice until combined. Sift the Confectioner’s sugar to remove lumps and add it to the egg whites. Beat on low until combined and smooth. Use immediately or keep in an airtight container. Tip: Start with the lesser amount of confectioner’s sugar and add more until the desired consistency is reached. The lesser amount is good for a flooding consistency, and the larger amount is good for outlining. Tip: Royal Icing starts to harden as soon as it’s in contact with air, so make sure to cover containers with plastic wrap while not in use.